A dominant display from Lancaster led to Roses success for the men’s badminton 1st team for the first time in 16 years. Having won this fixture on only one occasion, way back in 2000, the team knew that victory this year was far from an easy task. However, on the back of their best ever season, confidence was high going into this match and they didn’t disappoint. This doubles match between Lancaster and York consisted of 9 games in total and each game was the best of three sets played to 21 points. Lancaster Captain Adam Stewart paired up with Syed Bilal and they impressed throughout the day, enjoying consecutive 2-0 victories. Although they faced some tough opposition, their skill and energy proved too much for the visitors. Viktor Mandev and Edward Yang also remained unbeaten, although they were forced into a final set on two occasions. In a tough opening game, the determined pair battled through a nervous final set narrowly overcoming Ingham/Pakhania by 21 points to 19. 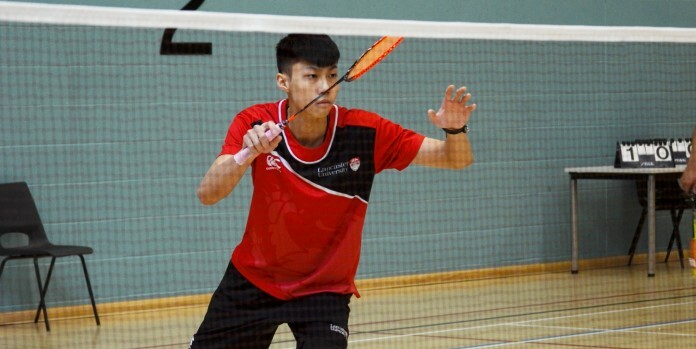 It was a tougher day for Jason Fung and James Chan who suffered two straight-set defeats to put some York points on the board. They did, however, pull off a remarkable comeback in their second match, overturning a 1-0 deficit to eventually beat Judd/Martyres. They held their nerves in a tense final set which finished 21-17 to the Lancaster side. In what has been a “dream season”, this talented Lancaster side have remained undefeated, won promotion in the league and became champions of the BUCS Northern Conference Cup. Roses victory was certainly the icing on the cake. Half way through proceedings an announcement rang out across the Sport’s Centre declaring that Lancaster University had won Roses 2016. This brief interruption to the match only added to celebratory atmosphere around the hall and boosted the confidence of the Lancaster team. It wasn’t long before they finished off the job and added more points to the total.